This image was disqualified from the Hidden Gem -- 1,000th Challenge! challenge. A shot of my cat I took on July 28, 2007 with my Sony Alpha 100. Three seconds later, she was pouncing on a stick my son was waiving in fron of her. It is by far one of my favourite images, in part because I am crazy for my cat and in part because of the attitude of Felie, about to jump out of her hide. She looks so wild! Exposure, shadow adjustment, contrast, clarity, vibrance, curves. Cloned out some disturbing grasses, dodged and burned, brightness/contrast, smart sharpen (twice), warming filter, color balance to correct yellow and green cast, border, save for web, sharpen once more and that's it! gave this an 8. I did not know that this type of border was illegal and I am honestly quite surprised at this. I haven't been very active in the last year though, so that might not be unexpected. The continuity of color is particularly effective in this one: leaf - grass - eyes. Too bad for the DQ!!! I really love this shot!! What a shame this was disqualified. I really love this, and I'm a dog person! Excellent capture, wonderful DOF, well composed and good colors. I like this a lot. This is a fantastic shot .. the cat's eyes are simply brilliant and the composition with the leaves very appealing. BUT the frame really does not do this justice as it is far too distractingl. Fabulous use of green! The border works nicely against the blurred edges. Love this! Just waiting to pounce! So perfect how kitty is looking right at you. Outstanding study of an animal. You've captured the ideal of a cat very well. I'm not fond of your border, but this shot is one of my favorite pet portraits ever. Wonderful composition! I'm lovin' the greens. Very cute, great colour, very clear. I am not a cat person but I like this photo. Not fond of the border though. Great playful shot. Balancing the greens of the eyes off the grass and leaves works really well, and allowing the grass to blur out in the foreground pushes the eye into the shot and the main subject. I also love the circular shape of the leaves that mirror the eyes and act as a visual stop to keep the point of interest firmly on the cat. Extraordinary capture, the POV and color are really intense. Fantastic. I even like your funky border. Of course, I'm a sucker for good cat shots, and this one is transcendent. Great framing with the grass and leaves. I also like your border. This is definitely how to capture a cat shot. Great job! nice shot, but i don't like the frame..!Why did you need that? Those eyes and ground level composition have made for a superb cat portrait, this really is very good, but IMHO I think I would have preferred it without the frame though. The border is distracting, I would have voted higher without it. haha - how cuuuuute! Love that the green compliments his (or her) eyes. Border is really cool too. Great Bokeh with the grass. Not liking the frame but love how the eyes match the grass and leaves. Good picture! Nice pic. I like the focus and angle of shot. Not an ordinary pet shot! I really like the depth here. Congratz on an awesome capture. If she weighed 100 pounds, you would be in serious trouble! composition is great, colors are rich and beautiful dof is nice, and you go and ruin a shot like that with that frame. love the photo hate the frame. Great shot. 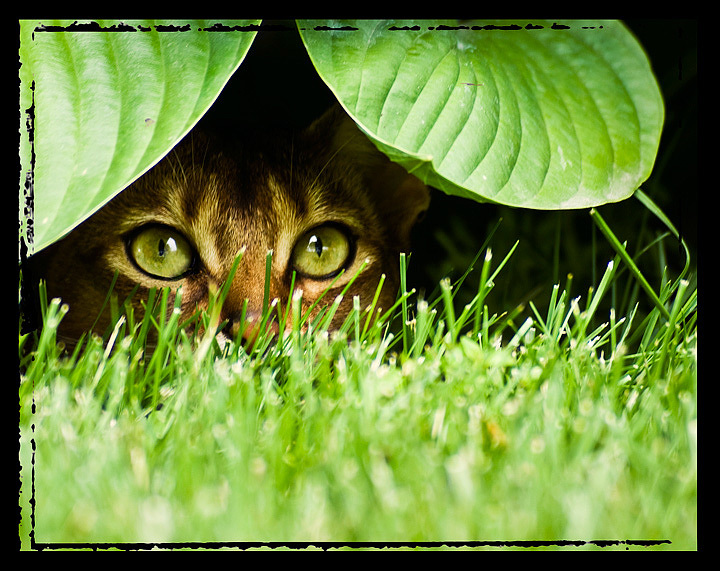 I like how the cats eyes are the same colour as the leaves and grass. Well done, I really enjoyed this photo. Outstanding shot. I would of done a tighter crop and lost all framing. This is really a cute pose. It's an unusual border but I like it. Good catch lights. I really like this shot but feel the interior border hurts this shot imo. Great cat shot. The green eyes within the green suroundings are wonderful. fabulous color in this photo, like the effect the focus on the cat has on the grass in the forefront and background. Love this. What a great capture of kitty doing his thing. The green leaves and grass really accent the eyes as well. Lovely capture. Great that th greens all around match. Border is a bit much for me. Love those eyes!! A cat at its best - doing what it likes best - waiting and watching for that perfect moment to pounce! Perfectly framed by those green leaves and the grass. Just an all around delightful picture. I like the colors and your use of the border. The green eyes really make this and the dof is spot on. Not keen on the frame though. Love this. Cat person- I can't help myself. This would make a cool poster. Cute one. I like this (despite the border). the eyes draw you in. Stunning portrait with an incredibly strong pull into those eyes. Loving the shapes created by the green leaves and grass - a great irregular frame. Not so keen on the digital black frame, myself though. Great use of color, fun composition, one of the best pet shots I've seen. Your shot is very nice, but the framing is rather distracting, pity. Love it. Like the framing. the greens are great. Frist Ten! The focus and colors are BRILLIANT here but the border is very unnecessary, and might even be illegal...not quite sure. I hope it doesn't DQ you because this picture is brilliant. Proudly hosted by Sargasso Networks. Current Server Time: 04/25/2019 07:44:05 PM EDT.